I was stumped by RDP’s inability to see my T520 machine, until I tried the string “t520” instead. Who knew? Why Windows Machine Names Are Case-Sensitive in RDP: It’s the Certificate! The only thing I can figure is that the first time I connected to this machine, I used the lower-case version of the machine name instead of the upper-case version. Turns out that while machine names in Windows are completely case-insensitive, certficate names are case-sensitive. 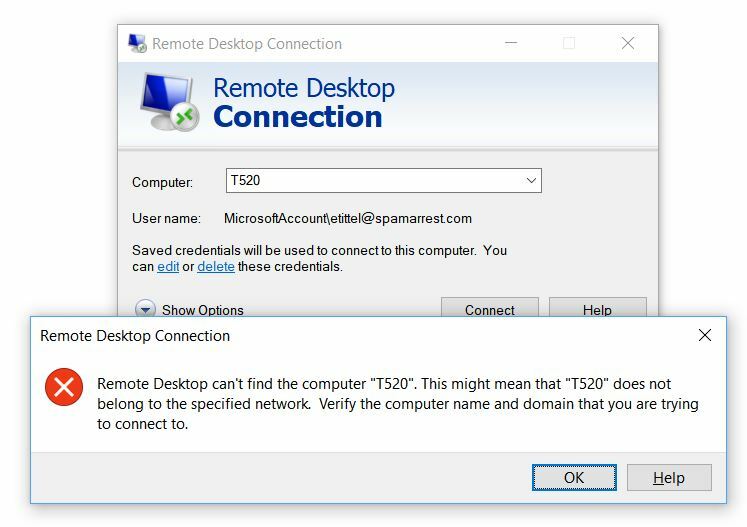 And because a certificate is used to negotiate the connection between the host and the client when using Remote Desktop, case matters. I’m just glad the T520 name only allows for two variations, or it might have taken me a while to figure out exactly what string I needed to use to get from Point A (my production desktop) to Point B (the T520 laptop). Here’s confirmation for you. Further experimentation with other local machine names vs. certificate labels provided further proof.